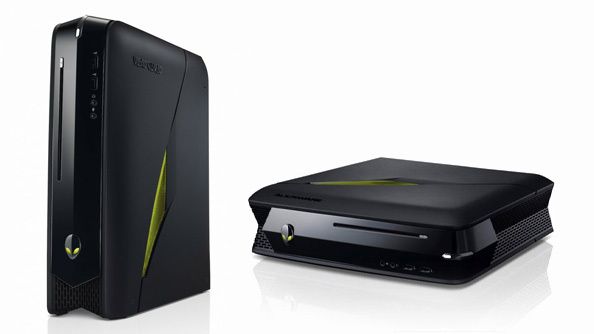 Alienware’s X51 looks like a PC crossed with a games console, or a tiny Batmobile. It looks like a cool robot’s lunchbox, something that might have just hovered through a rift in space-time, a wormhole to an alternate dimension where the default design of technology is ‘angry with 8,000 distinct chassis lighting patterns’. But where has it come from? Space? No! Not space. It’s come from the engineers at Alienware. Product manager Eddy Goyanes was more than thrilled to explain how the living-room friendly PC came about, Alienware’s thoughts on Surface Pro, and how they drop tested the Aurora. Hello. You’re onPCGamesN. We’re a new site that combines original journalism, user submissions and the best headlines from across the web. Feel free to comment or follow us on our PCGamesN Twitterfeed for regular updates. 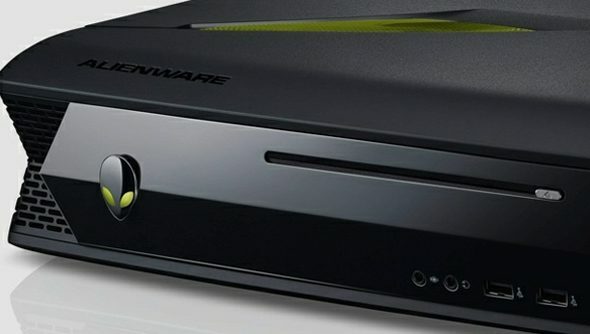 PCGamesN: So what made Alienware decide to start work on the X51? Eddy Goyanes: The X51 has been an exciting product for us, it’s enabled us to take desktop gaming to a place we haven’t been able to take it to before. We’d been hearing a lot of commentary within forums about gamers wanting a system that was capable of playing all their games at HD resolutions with reasonable levels of performance – so they wanted 1080p gaming, and at least 30fps on high settings. We thought, why don’t we create a machine that not only can achieve that, but will also give users a more versatile experience? That’s exactly what we set off to do.We wanted users to be able to have a system that they can position within any living area. Some people want a PC in the living room, but they’re not comfortable having a full-size desktop in that space. Maybe you’re a student, or you’re away from home – with the X51 you get immersive PC gaming whether it’s a two foot experience or a ten foot experience. This system caters for those different settings. We also wanted to make sure that we’re still going to have an upgradeable device. The optical drive in the X51 is a mobile compenent, but everything else is made up of a desktop components, and it’s all easily upgradeable. You won’t get the same level of upgradability as you would with our larger desktops, but it’s still upgradeable and still very powerful. PCGN: Speaking of upgrades – Apple’s latest MacBook is controversially upgrade and repair-proof. Would you ever consider a similarly locked down Alienware notebook? EG: Notebooks are different kinds of animals altogether, and it depends which sized notebook you’re talking about. The CPUs in our notebooks aren’t soldered: you can upgrade the CPU, the hard drive, memory, wireless. I’ve seen people on our forums who’ve changed out the optical for a hard drive. So there’s a lot of upgradeability that can occur, even in the notebook space. For gamers, the potential for upgrades is always something they consider when making a purchase. So there are no plans to make any of our systems closed-off or of non-upgradeable design. No way. Our audience would have to change dramatically for that to occur, and I don’t see that happening any time soon. PCGN:What challenges were involved in cramming a full desktop-spec machine into something as small as the X51? EG:We knew that customers wanted a certain level of performance from the X51, so we built it to be able to accommodate up to 150 watts of graphics, that is, any PCI Express x16 graphics card requiring up to 150 watts could be properly cooled and powered with the system. We also managed to get SandyBridge and IvyBridge processors on the system, and these are full-voltage desktop CPUs. There are also up to two DIMMS slots for memory and one hard drive. So we did have to make the concession of only enabling one hard drive, one optical, one graphics card and two DIMMS, but we felt that that was sufficient to achieve the level of performance that gamers wanted, while still conserving as much physical space as possible. We also included wireless N tech, so that would allow some flexibility in where the machine is placed around the home. PCGN:Would you describe the X51 as the “PC console”, then? EG:That’s an interesting question, and we get it a lot. So the thing is, the X51 is designed to be complementary, it’s not here to take over or replace any console system. We know lots of gamers appreciate console gaming as well as PC gaming, but when gamers want to experience a better and more immersive experience than what’s possible on a console, that’s what the X51 is for. PCGN:Did you pay close attention the specs and pricing of the Xbox and Playstation when developing the X51? Was it even a consideration? EG:Not really. As I said the system isn’t there to replace those consoles, it’s there to complement them. In the States at least, the pricing for the Xbox and Playstation is well below the X51, but then so is the performance. We see them as positioned very differently in terms of what the customer experience is going to be. They’re not equivalent, it’s a different space altogether. There are so many titles exclusive to PC and the social experience is very different, these things are unique features that need to be considered when making the comparison between console and PC. PCGN:Some reviewers reckon the X51’s PSU is relatively underpowered – do you think that’s a fair criticism? EG:I think it’s a misconception. With larger desktops that can enable dual graphics cards, liquid cooling, four or more hard drives – where being able to upgrade is a high priority – you definitely would want to have more wattage than what you’ve got in the X51. But with the X51, we’re not cutting off any of the components from the performance that they’re capable of. So the CPUs that we use, for example, are desktop-class CPUs, and they’re given the full 95 watts. We’re enabling 150 watts of graphics, which takes you up to a GTX 560 graphics card. The other components really don’t require that much power, things like hard drive, memory, wireless and optical. They’re pretty minimal when it comes to power consumption. So while it’s true that gamers aren’t used to seeing a 330w power supply on a desktop, for the X51 it’s sufficient to power all that tech and still enable that experience that we’re talking about. Of course you’re not going to be able to have the likes of a GTX 690 graphics card in there, that’s a different beast entirely – for that level of performance you’d need to look at an Aurora – but again the X51 is meant to give you this 1080p gaming experience across all modern titles out today. You’ll be able to run these games on high settings, rather than ultra settings. PCGN:How much design work went into the X51 chassis itself? EG:We wanted to really capture the Alienware industrial design, so there are several vents and around the chassis you’ll find three AlienFX lighting zones that can be switched on or off or changed in colour. The dual orientation mode is neat too: when you turn the X51 on its side you can rotate the alien head logo – so it’s going to look good wherever you put it. It’s got a very sleek design, it’s intended to stand out. It’s small enough to fit in all kinds of TV units, wall units and desks. We wanted to make sure we captured those three key things: that very specific level of performance, the versatility of putting it in any living space, and that it would clearly communicate the Alienware industrial design. It was those three ingredients that drove us to create the X51. PCGN:How rugged is it compared to a console? Could we chuck it in a backpack on our way to a LAN party? EG:Heh, in terms of ruggedness, well, I’m not certain what happens when you drop an Xbox or a Playstation, but we do conduct a good amount of drop testing with our platforms. It’s actually pretty resilient. If you’ve never held one in your hands, check it out, it’s rather heavy and somewhat rigid. It’s about 12 pounds and a tad larger than an Xbox 360. So yeah, I think it’d be very easily transported in a rucksack! Definitely the LAN gamer’s dream. PCGN:Umm, so you drop test the Aurora desktop PCs too? EG:Yeah, we drop test all of our systems! It’s primarily conducted to make sure our packaging is strong enough to support most accidental impacts during shipping. So that it arrives in good shape. That’s done across our entire portfolio. PCGN:What did you guys make of Microsoft’s Surface Pro? Could it be a capable gaming tablet? And do you guys have any plans to move into that field? EG: It’s a really neat device actually, I think it’s pretty cool. But we’ve yet to see its capabilities in the gaming space, it will be really interesting to see how Microsoft enters that arena, if at all. We’ll be keeping our eye on the pulse of that device. If it does try to get into the gaming space, it’s definitely not going to complete on the level of any of our products. If you look at it from a wattage perspective, it’s not going to be able to have high-performance class gaming. Right now we don’t have that in our sights, except we are constantly looking at what technology is out there in the marketplace. You know, with the M11X we started a new gaming space among notebooks, right? You never had that kind of gaming performance on an 11-inch notebook. With the X51 we’ve introduced an Alienware desktop that gives you a certain level of immersion that we didn’t have before with this size and this price of desktop. So as technology enables us to create these unique experiences, we will continue to look for the best solutions for gamers, to give them the best experience possible. If in the future there’s an opportunity where we could deliver that Alienware experience in a new class product, then we’ll definitely be there.